The Federal Reserve raised rates by a quarter of a point, and the market reacted well to the news. The biggest laggards over the last couple of weeks were the biggest winners yesterday; Small caps and oils. The bank stocks lagged and that probably was due to Yellen’s comments about future rate hikes, they are not written in stone. 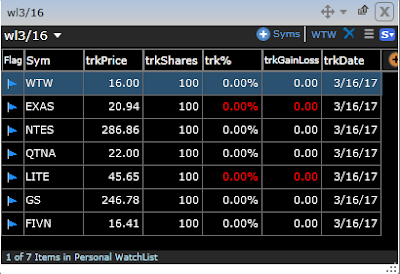 $WTW, $EXAS, $NTES, $QTNA, $LITE, $GS, $FIVN, are the stocks on my watchlist today.